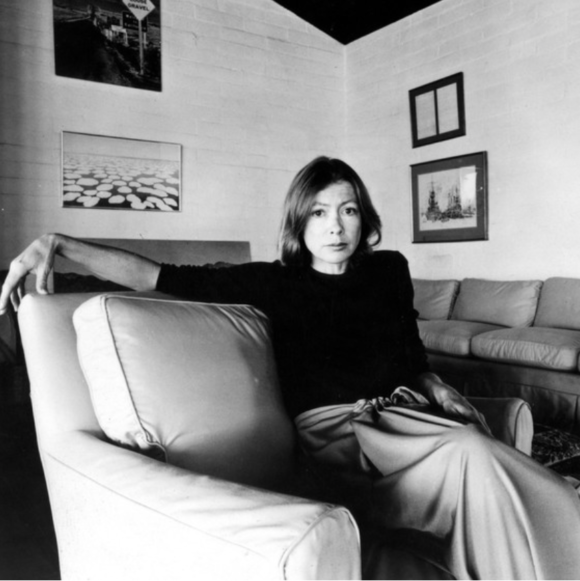 Joan Didion, The Center Will Not Hold, is a captivating documentary on her life and work. A rainy Sunday was the perfect opportunity to watch the new Netflix documentary Joan Didion, The Center Will Not Hold. 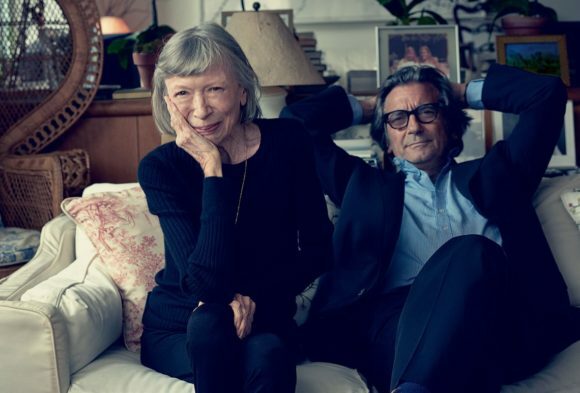 Conceived and directed by her nephew, Griffin Dunne, the documentary covers the span of Didion’s career, personal milestones and tragedies. 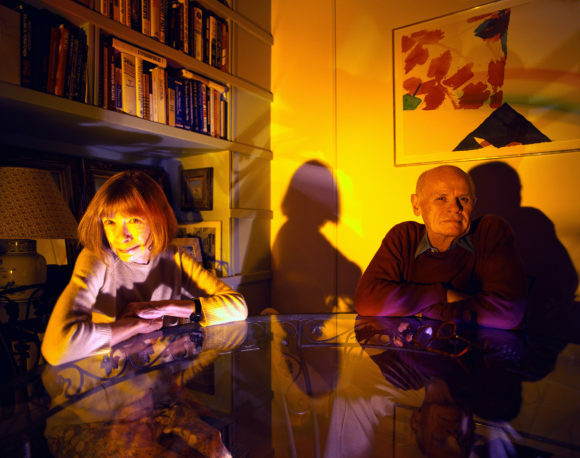 Dunne appears in the film as well, to conduct the interviews with Didion in her home. His obvious closeness to his aunt allows him to make this a deeply personal film. Didion answers his questions directly without the usual coolness displayed in other interviews I’ve seen of her. 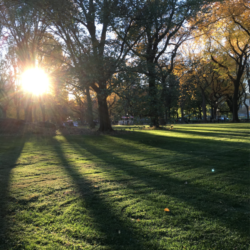 She speaks with a certain detachment and honesty that comes from having long before examined and processed any questions that could be asked of her. There is no soul searching on the spot, in Didion fashion this has already been done. Family photographs, of which there are many, some that have already been burned into my minds eye, illustrate the film. In them Didion looks cool, self possessed, beautiful and glamorous in a no nonsense way. 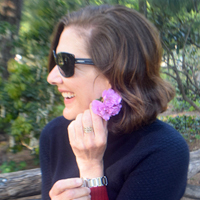 She has an innate sense of style that has changed little over the years and still serves her well. In SanFrancisco researching for Slouching Towards Bethlehem 1967. 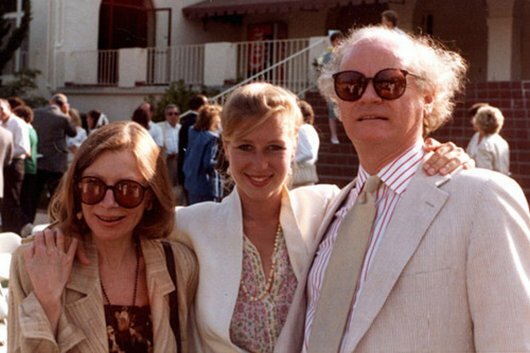 With husband Jonh Gregory Dunne and daughter Quintana. 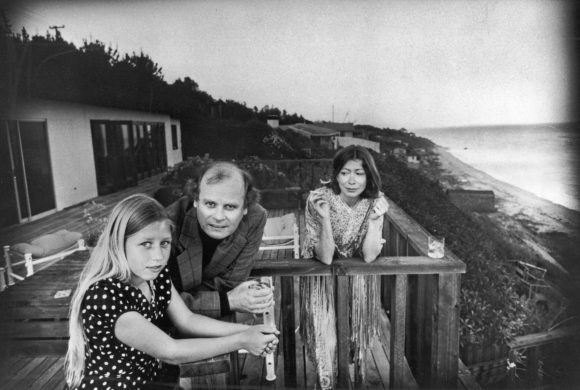 I especially love the images of Joan Didion with her husband John Gregory Dunne and daughter Quintana from the Malibu years. In them Quintana is a beautiful little girl with white blonde hair. The proud parents obviously enamored with her. 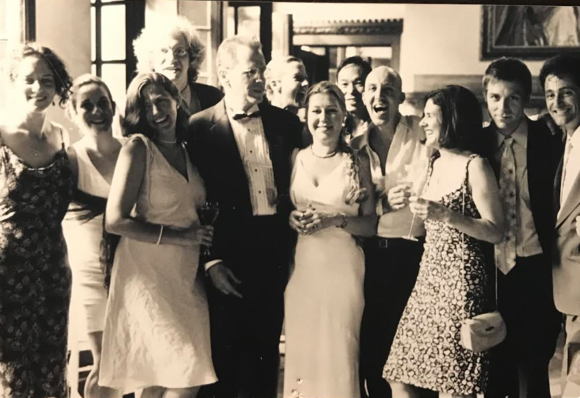 I was at Quintana’s wedding and I’ll never forget the toast Dunne made. He said every morning when he dropped her off at school he would wait and watch as her little blond head bobbed out of sight. Such an ordinary moment yet indescribably magic as he told it. He told Joan, she had to come see this. I don’t know why this always stuck with me; maybe because just a couple years later I was standing at the school gate watching my own daughter’s blond head disappear in the crowd. There’s something beautiful and heartbreaking at once in the image. That sense of loss as a child grows up and gains independence comes through in the documentary. 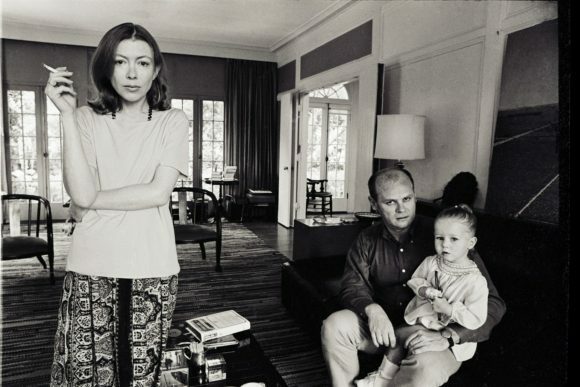 The heart of the film deals with the tragedy Joan Didion suffered, losing her husband and daughter within a year and a half. 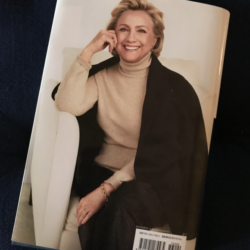 She wrote The Year of Magical Thinking in the aftermath of her husbands death and while Quintana was gravely ill. I read this after the unexpected death of my mother and it helped more than anything else to process my grief. It’s a book that should be in every home library. It starts, “Life changes fast. 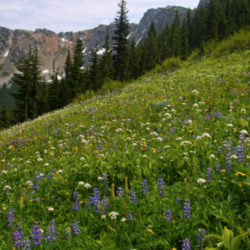 Life changes in an instant.” This is a universal truth. The pain of loss is still apparent as Didion recounts this period, though she speaks eloquently and openly about it. With Dunne at home in New York, 2000. 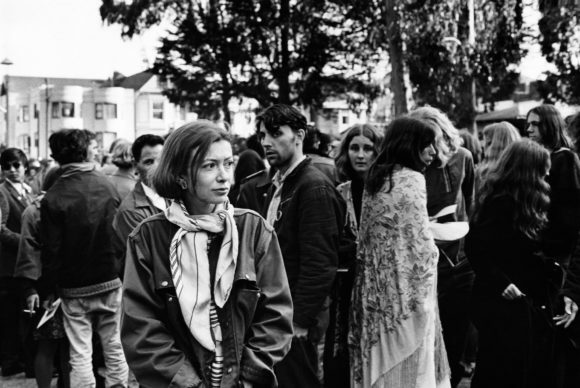 Joan Didion, The Center Will Not Hold, is a touching examination of the life and times of a brilliant writer and astute chronicler of the human experience. Best of all it comes directly from the source. 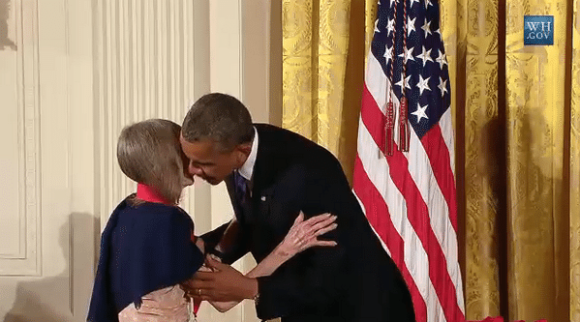 Didion receives the National Humanities Medal From President Obama 2013. Have The Kardashians Killed Fashion?